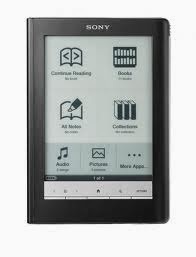 I’ve been a big fan of the eReader ever since I first heard about the idea. I still have (and probably always will have) a big place in my heart for the lovely paperbacks that will one day be displayed properly in the new house as opposed to hiding in boxes but I can’t resist the convenience factor of an eReader. And any excuse to squeeze an extra pair of shoes into an inevitably already over-stuffed holiday suitcase will always be fine by me. Me and my long-suffering bag-carrying boyfriend. When I first got an eReader in August 2010, I went for the Sony eReader Touch (a PRS-600, if we’re being super accurate). I didn’t make the decision because of any moral aversion to buying a Kindle but I liked the idea of a touch screen (which was pretty unique at the time and came accompanied with a little stylus for easy note-taking) and the fact that I could buy eBooks from more or less anywhere I wanted. Except Amazon, obviously. Flash forward to November 2013 and poor Colin was showing signs of ageing. He still looked the part (I’ve always thought that the Sony design is quite sleek, particularly in comparison to the earlier versions of the Kindle with the keyboard that I personally wasn’t a fan of) but everything was getting a little slow. The screen started to flicker sometimes when I was turning a page and the whole ‘turning the page’ experience was starting to take a slightly irritating amount of time. I could have lived with that out of a probably unhealthy degree of affection for the inanimate eReader but I couldn’t live with it crashing and becoming completely unresponsive at what was usually at crucial and/or particularly gripping parts of books. 1. It glows! The screen has a special little lighting up feature that isn’t backlighting and so doesn’t hurt your eyes when you read for long periods but does mean that you can read when you run out of natural light. Very handy indeed for when you’re travelling, say, and want to read but can’t turn the car’s interior light on. Also pretty useful if your boyfriend happens to not be a reader and finds it difficult to understand why there are some times when it is nigh on physically impossible to just stop reading and go to sleep and does not appreciate a lamp. Alternative: The Kindle Paperwhite apparently isn’t the only eReader available in the UK that glows. If lighting up your surroundings is your idea of fun, you could also try the Nook Simple Touch GlowLight for a quite frankly bargainous price of £49.99. 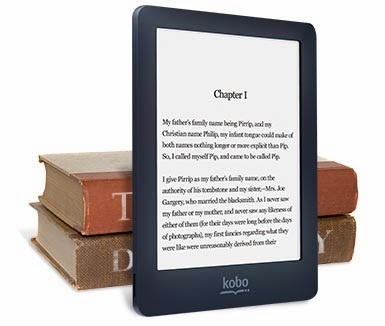 Kobo also have one that I’ve mentioned below. 2. One Stop Shop: I despise this phrase that my firm seems to have adopted recently but it serves a purpose here, I promise! When I first got a Sony, I loved being able to shop around, dig out the best prices and make the most of almost any eBook sales. As the years went by though, it became apparent that Amazon was the best at making eBooks consistently available for a reasonable price and it got a bit annoying if there was a particular eBook that I wanted because I felt as though I had to check my favourite eBook sources to find where it was most sensibly priced. I also prefer that I can now download free classics in a set format, rather than relying on Project Gutenberg or similar to make a work look a certain way. Still want to be your own bargain hunter? The newer Reader from Sony has Wi-Fi capability and still gives you the freedom to shop ‘til you drop all over the internet. If it’s diversity of opportunity when it comes to your eBooks, this reader still seems to be a solid bet. UPDATE (with thanks to Ellie): The Kobo Glo also gives you freedom with easy access to Kobo, which I actually used to buy a lot of eBooks from because their prices were pretty reasonable so this is a good alternative to a Kindle Paperwhite from what I can tell from a bit of a nosey around the internet. I thought that the Nook was exclusively for Barnes and Noble (and I don’t know what the prices are like in the UK so have no idea what that really means for readers) but I am most reliably informed that you can use it for whatever epubs you can get your hands on! 3. Shopping on the go: This is one of those things that I love about my new Kindle that isn’t new to others at all. Back when I got my original Sony, I don’t think that there were as many eReaders with Wi-Fi capability. Not having to plug the Kindle into my laptop every time I want a new book is the best. Makes spending all of my money on eBooks that little bit easier! Alternatives: Pretty much any of the other eReaders in the market, I’d guess. 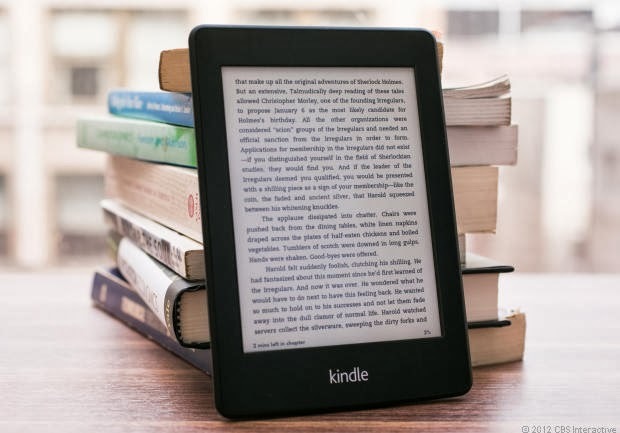 Alternatives: This is another of those things that I think all eReaders offer these days and I haven’t seen enough eReaders “in real life” to make any real judgement on their prowess in this area. I was going to write “sorry” but seeing as I am in no way actually a technology buff, I feel as though that lack of knowledge is kind of ok.
5. All the rest… It’s super quick. There’s a nifty dictionary thing so I can hold on a word and it’ll define it for me. Apparently, I can also press on a character’s name and it will tell me about that particular character (I haven’t tried that properly yet!). I charged it on Boxing Day and I haven’t had to charge it since, despite having messed about on it pretty much daily. It has a magical case that turns it on when I open it (because turning things on actively is for chumps, obviously). The verdict? I love the tentatively named Garfield the Kindle Paperwhite rather a lot, actually. And I now don’t have to be the plonker that responds to the question, “Do you have a Kindle?” with the slightly annoying (probably), “No – I have an eReader but it isn’t a Kindle”. There’s also clearly some merit in keeping electronic devices for quite long periods of time because then when you replace them, the new technology seem like wizardry!